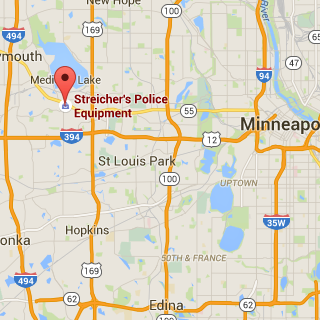 Located just west outside of Minneapolis in Plymouth, MN, is Streicher's corporate headquarters and main retail store. We've been serving the Minneapolis and St. Paul area for over 60 years, and our Plymouth location allows us to reach the rest of the state efficiently. We're located west of Minneapolis, just off of 55 and Hopkins Crossroads. Take 494 and head east on 55, or 169 and head west on 55 to reach us quickly. Streicher's Minneapolis is open to the public! Stop in anytime to find the latest apparel, footwear, and gear for the tactical and outdoors enthusiast. Not everything we carry can be sold to the general public, but the vast majority of products we carry are available to any profession or enthusiast.